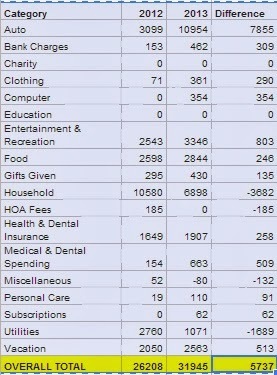 This is the third year (see last year's post) I've looked at how my spending by category compares from one year to another. How insightful to look back and see where the money went, but also to see how my spending patterns change over time. I sold the Corolla and replaced it with a scooter. I use it for most of my local driving now. I should note that I was paid $3,000 for the Corolla, which entirely offset the cost of the scooter. While the cost of the scooter is included in my expenses, I did not report the income I received from selling the Corolla. I used the S-10 for a cross-country mystery shopping route. It eats gas and also required a number of repairs throughout the year. Entertainment Expenses increased by 32%. We saw more movies and I spent more on gambling. I cut my Housing Expenses by moving to a smaller home in Florida in August 2012. Housing dropped from 33% of annual spending to less than 22%. The cost of utilities declined, but partly because the power company applied my deposit towards the monthly bill for a few months. Spending on Medical & Dental increased. Insurance premiums went up and I had to have a root canal retreated. I may consider replacing the S-10 with a more cost-effective car for mystery shopping. We will continue the theme of "spend on experiences, not things". I would like to plan an international trip in 2014, so travel expenses will probably increase.